Women Outdoors welcomes comments from our members. We invite you to share your outdoor experience, ideas and perspectives with our community of outdoor women. To add a comment, you need to login first. If you've forgotten how to login, go to the FAQ page for instructions. Get Ready for Women Outdoors—Unleashed! So you’ve been active with Women Outdoors. You’ve done a few hikes around the neighborhood, maybe gone on an overnighter or two, perhaps gone paddling, and you’ve very likely made some wonderful new friends. Maybe you’re wondering ... what’s next? So are we! That’s why we’re thrilled to announce a new initiative that we’re calling Women Outdoors: Unleashed! What does that mean? Anything we want it to! To those Women Outdoors members who travelled to New Orleans to work for a week building houses with Habitat for Humanity, it means a service trip that put us somewhere where we could help to change people’s lives. It can mean a trip that’s more intense than most in other ways, whether it’s a longer time commitment, a trip that carries you to exotic lands, or long-term training to accomplish a fund-raising marathon or long-distance hike. In 2006, Habitat for Humanity India launched an ambitious five-year campaign, called IndiaBUILDS, to provide shelter and stability to 50,000 families. As part of the campaign, Habitat India is bringing different segments of society together to build – including women from all backgrounds. In March 2010, Habitat India will host more than 100 international volunteers, from several different countries, to help build houses. The volunteers will work alongside members of local women’s savings groups as part of Habitat’s “Women Build” initiative. Wilderness Heals is an all-female, three-day pledge hike to raise funds for the Elizabeth Stone House. The hike brings together women from all over New England to raise awareness about domestic violence and trauma, and also raises the much-needed flexible funding that helps the Stone House meet the needs of the families it serves. Each hiker is responsible for raising a minimum of $1,200, which goes directly to supporting the work of the Elizabeth Stone House. How do we make it happen? The trips we’ve listed here are just a sample of what we, as a group of talented, energetic, motivated women, could accomplish if we set our sights high. Do you have other ideas for Unleashed! trips? Excellent, we want to hear your ideas! So where do we go from here? As you can surmise, Unleashed! trips need more planning than most Women Outdoors trips. They need champions who are devoted to seeing them happen. They entail more logistics, whether it’s travel, lodging, or liaising with sponsoring organizations. Women Outdoors is asking for champions to step forward and take ownership of an Unleashed! trip. That means researching such trips, dealing with trip logistics, recruiting Women Outdoors members to participate, delegating responsibility and whatever else a particular trip requires. If you’re up to it, we’re up to helping you make it happen. We’re willing to use the Gathering to help you nurture your Unleashed! trip, whether it’s an informational workshop you want to present on your trip or simply a venue to pass out flyers to Women Outdoors members as you work to solicit participation. So let’s do this: Start thinking about what you want to do with your life. Start thinking about the good that you can do others. Start thinking of the countries you’ve always wanted to visit and the cultures in which you’d like to immerse yourself. Start thinking of Women Outdoors as the organization of women who will happily walk with you, hike with you, and strive with you, to make your dreams come true. Now’s the time to make it happen! Already have a great idea for an Unleashed! trip? Tell us about it, so we can start helping you plan! Tell us whatever you know about your trip and send it to SpecialEvents@womenoutdoors.org. We look forward to dreaming with you! Register by May 1 to get a $20 discount. Who: Women Outdoors members (not a member? Join when you register). Children welcome, boys only to age 8. How: Click on The Gathering to learn more and to register today. Cost: Varies from $100 to $275 depending on your length of stay and accommodations. See you in the outdoors. Here's something right up Women Outdoors' alley, or trail as the case may be - National Public Lands Day. Begun in 1994, National Public Lands Day is "the nation's largest hands-on volunteer effort to improve and enhance the public lands Americans enjoy" according to their web site. Part of the Women Outdoors vision statement is to promote environmental stewardship by creating and participating in earth stewardship programs. National Public Lands Day on Saturday, September 26, 2009, offers us the opportunity to do just that. As outdoors women, we enjoy public lands every time we hike in a state or national park, canoe or kayak down a river, bike on Rails-to-Trails path, cross country ski in a national forest, or participate in any other number of outdoor activities. Last year, more than 120,000 people in every state helped care for shared lands on National Public Lands Day. Volunteers showed up at national parks, state and local parks, lakes, rivers, beaches, wetlands, wildlife refuges, forests, you name it, to build trails and bridges, plant native species, remove trash and invasive plants, and provide stewardship for the outdoor spaces we so cherish. Visit National Public Lands Day to find a site near you or to register a site that your group or Women Outdoors region will coordinate. See you in the outdoors (and probably on public land). Marion Stoddart, one of the founding mothers of Women Outdoors, has long inspired many members of our organization with her environmental activism, enthusiasm for adventure travel, and amazing life story. Now the world can discover Marion Stoddart through the documentary film, The Work of 1000, honoring the life and work of this Massachusetts environmental pioneer. Produced by Susan Edwards and scheduled for release this winter, The Work of 1000 will chronicle Marion's indefatigable campaign to clean up the Nashua River in north central Massachusetts in the 1960s. At that time, the pollution-choked Nashua River, one of the top 10 most polluted rivers in the country, flowed in eerie colors and with a biting stench from the chemicals dumped by dye manufacturers near Fitchburg. Marion spearheaded the campaign to clean up the Nashua River and enlisted many allies at the local, state and national level in her cause. She would simply not take no for an answer in her fight to clean up the river. Her tenacious advocacy led to the complete restoration of the waterway into a healthy and vibrant river that today is a mecca for swimmers, kayakers and fishermen. Decades after her advocacy work, Marion founded a travel adventure business, Outdoor Vacations for Women Over 40, and has led groups of women from diverse backgrounds on trips across the country and around the world to hike, kayak, cross-country ski, and partake in a host of other outdoor activities. Marion gave the keynote speech at the 25th Annual Women Outdoors Gathering in 2004. To learn more about Marion Stoddart and The Work of 1000, visit www.workof1000.com. Great news! The Sargent Center will be open next year! We are thrilled to find out that the Sargent Center for Outdoor Education will be open in 2010. As many Women Outdoors members know, the Sargent Center was slated for closure on August 31, 2009. At this year's Gathering, a number of women volunteered to serve on a search committee to find another venue for the 2010 Gathering. The chair of the search committee kept in contact with the staff of the Sargent Center and heard there was a possibility the Sargent Center would remain open in 2010. When that possibility became a reality, she immediately reserved Memorial Day Weekend 2010 for the 31st Annual Women Outdoors National Gathering. Thank you to everyone on the committee for your great work. According to the Sargent Coalition Facebook page, "Thanks to an agreement between Nature's Classroom of Charlton, Massachusetts, and Boston University, Sargent Center will remain open to schools, conference groups and campers after August 31. Boston University will retain the ownership of the property and offer Nature's Classroom a short-term operating lease, allowing programs to run much as they have in the past." Our 30th Annual National Gathering now lives on in our memories. We enjoyed beautiful weather all weekend with just a little rain one night and afternoon. Highlights of the weekend included hikes to the heron rookery (and a moose sighting very early one morning! ), wildflowers galore, a bald eagle in her nest, kayaking on Half Moon Pond, Erica Wheeler's wonderful concert, bike rides long and short, and many cherished memories. The Sargent Center staff treated us to a special slide show on the nearly 100 year history of Sargent Camp and its founder, Dr. Dudley Sargent. The "then and now" photos were especially moving. While we had to say good bye to the Sargent Center, the Gathering's home for the past 20 years, we see this as an opportunity to say hello to a new venue for our 31st Gathering. A group of Women Outdoors members are already working on finding a place for next year's Gathering. Stay tuned. Take a Hike on National Trails Day! On Saturday, June 6, celebrate National Trails Day by taking a hike. Sponsored by the American Hiking Society, National Trails Day aims to increase awareness and stewardship of hiking trails nationwide. Women Outdoors partners with American Hiking Society and supports their efforts to inspire the public to discover and enjoy the wonders found along our favorite trails. Women Outdoors Mid-Atlantic will celebrate National Trails Day with a hike at Sugarloaf Mountain in Frederick County, Maryland. This will be the official launch of this new chapter of Women Outdoors. Sign up for the hike by clicking on the Special Events calendar on the Mid-Atlantic region page and then scrolling over to June 6 to get to the registration form. Women Outdoors applauds the passage of the Omnibus Public Land Management Act, signed into law by President Obama on March 30, 2009. Comprehensive in scope, the act is a dream come true for anyone who loves the outdoors. The Omnibus Public Land Act designates over two million acres of wilderness and adds over 1,000 miles of Wild and Scenic Rivers, 2,800 miles of National Trails, and 330,000 acres of National Conservation Areas. In addition, the act addresses the National Landscape Conservation System and the Forest Landscape Conservation Service, and takes steps to improve our oceans, coasts and Great Lakes. “Winters hardships are slowly giving way to spring, and our thoughts naturally tend to turn to the outdoors. We emerge from the shelter offered by home and work, and we look around, and we're reminded that the most valuable things in this life are those things that we already possess. "Now, as Americans, we possess few blessings greater than the vast and varied landscapes that stretch the breadth of our continent. Our lands have always provided great bounty, food and shelter for the first Americans, for settlers and pioneers, the raw materials that grew our industry, the energy that powers our economy. "What these gifts require in return is our wise and responsible stewardship. As our greatest conservationist president, Teddy Roosevelt, put it almost a century ago, "I recognize the right and duty of this generation to develop and use the natural resources of our land, but I do not recognize the right to waste them or to rob by wasteful use the generations that come after us." "That's the spirit behind the bipartisan legislation I'm signing today, legislation among the most important in decades to protect, preserve and pass down our nation's most treasured landscapes to future generations. On March 20, women outdoor enthusiasts can celebrate not only the first day of spring, but also the rollout of a brand new web site, www.WomenOutdoors.org. Women Outdoors, a national, nonprofit organization that promotes leadership, friendship, adventure and enjoyment, created www.WomenOutdoors.org as a way for women to connect with other women who share their outdoor interests and values. Check out the completely renovated Women Outdoors web site and here are some of the features you’ll find: professionally designed graphics, photos by Women Outdoors members, lots of new content, and easy navigation. Here’s a quick tour of WomenOutdoors.org. The About Us section describes the history of Women Outdoors, how we’re organized into regions, how we’re managed by a board of directors, and the principles we value as an organization. Our Regions offers a brief description of each of our nine regional chapters. Click on any of those chapter links and you’ll open up that region’s own web page filled with photos, links to their calendar of activities, special events, news, and a photo gallery. The Gathering page offers loads of information about our annual get-together over Memorial Day Weekend in New England. The Gathering brings together new and old members from across the country gather for a long weekend of outdoor experiences where women can have fun and challenge themselves in a safe and nurturing environment. With the new web site, for the first time ever, you’ll be able to register and pay for the Gathering online. Click on Latest News for press releases about what our national organization is doing as well as updates from the regions. You can also subscribe to an RSS feed so you’ll know as soon as anything new is posted. At Women Outdoors we want to share our love of the outdoors and the organization that helps us nurture our nature. The Resources page offers information such as Women Outdoors trip guidelines and Leave No Trace guidelines as well as links to other web sites of interest organized into categories such as clubs and organizations, adventure travel, outdoor gear, and other helpful information. We anticipate that after exploring our web page, many women are going to want to explore membership in Women Outdoors. To make that as easy as possible, we have a special Join Us page where women can click a few buttons, fill in a few fields, pay online and become a new member of Women Outdoors. An all-volunteer organization founded in 1980, Women Outdoors sponsors nine regional chapters on the East Coast, which organize activities such as hiking, biking, canoeing, kayaking, rafting, climbing, skiing and snow shoeing. 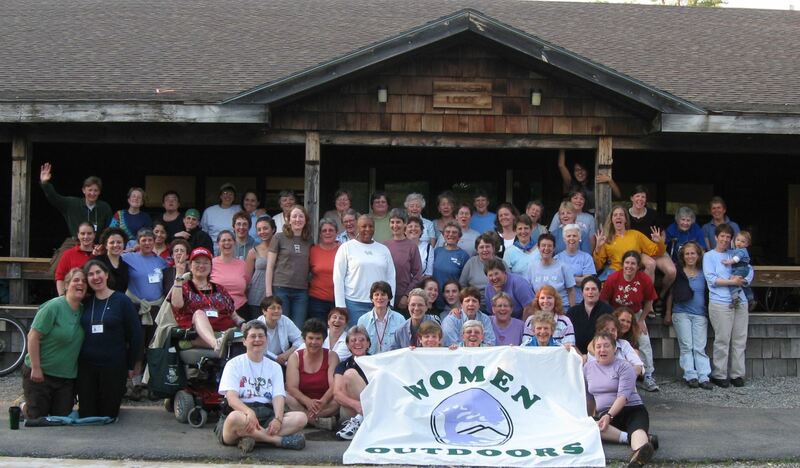 Women Outdoors hosts regional chapters in Connecticut, the greater Boston area, western Massachusetts, Rhode Island/Southeastern Massachusetts, New Hampshire/Vermont, the Finger Lakes Region of New York, Albany, NY, the Mid-Atlantic and South Florida. Women outdoor enthusiasts take note: A regional chapter of Women Outdoors will be starting in the Mid-Atlantic later this spring. We welcome women from Maryland, Virginia, Washington, D.C., Delaware and West Virginia to join us as we seek adventure from the Atlantic Ocean to the Shenandoah Mountains. Join Women Outdoors and register for the Mid-Atlantic region to receive the latest updates on this new chapter.